Rose Wilder was born December 5, 1886, in De Smet, Dakota Territory, the first child of Almanzo and Laura Ingalls Wilder. Laura tells of Rose's birth and early childhood in The First Four Years. When Rose was not yet two years old, Laura and Almanzo became very ill with diptheria. To protect Rose from contracting this dreaded disease, she was sent to live with Laura's Pa and Ma for several months. Rose became a big sister in August 1889, but sadly, her baby brother died before he could even be given a name. Just days afterward, a kitchen fire destroyed the Wilders' home. These disasters along with crop failures drove the Wilders from the Dakotas. The Wilders sought refuge at the home of Almanzo's parents in Spring Valley, Minnesota, so Rose was able to spend time with her other grandparents. In 1891, the Wilders went south to Westville, Florida, to live with Laura's cousin Peter. Rose wrote a fictional short story entitled "Innocence" in 1922, loosely based on her family's stay in Westville. The Wilders were not happy in Florida, so in 1892, they returned to De Smet and lived in a rented house in town. Laura and Almanzo worked and Rose's Grandma Ingalls took care of her during the day. Rose began school in De Smet, and learned to read and write very quickly. Photo courtesy of Herbert Hoover Presidential Library. Used with permission. In 1894, Rose embarked on her final childhood journey with her parents and their friends, the Cooleys. The two families traveled in a horse- drawn hack to the Ozarks in Missouri. Laura's diary of this trip was later edited by Rose and published as On the Way Home. Just like Laura at Plum Creek, Rose was the "country girl" at school in Mansfield, a fact which she resented. She was very intelligent, and thought school was boring because the work was far too easy for her. Because of this, Laura consented to let Rose study on her own at home much of the time. In 1903, Laura and Almanzo allowed Rose to go to Crowley, Louisiana, to live with her aunt, Eliza Jane, to complete high school. The Mansfield school only went through the tenth grade. Rose was very independent, and after her graduation in 1904, she learned telegraphy and got a job with Western Union in Kansas City, and three years later, in Mount Vernon, Indiana. 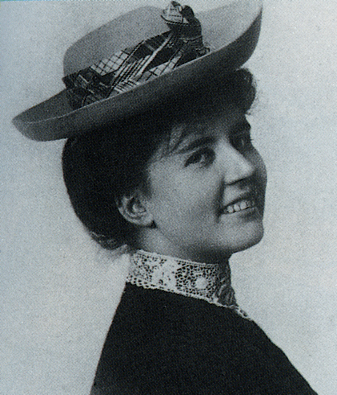 In 1908, Rose moved to San Francisco, and lived with a reporter for the San Francisco Bulletin, Bessie Beatty. Living in the same apartment building was Claire Gillette Lane, who became Rose's husband on March 24, 1909. Photo courtesy of Herbert Hoover Presidential Library. Used with permission. Rose and Gillette moved to Kansas City, and Rose worked for the Kansas City Post. In the summer of 1910, Rose gave birth to a baby boy, who died shortly afterward. After moving several times, Rose and Gillette returned to San Francisco, where they became involved in selling real estate. Rose's career flourished, and slowly, she and Gillette found less and less in common with each other. When World War I decreased land sales, Rose returned to writing. Rose then moved to Greenwich Village, New York, and became a ghost writer for Frederick O'Brien's White Shadows on the South Seas. ( Read this book here.) She also wrote The Making of Herbert Hoover under her own name. 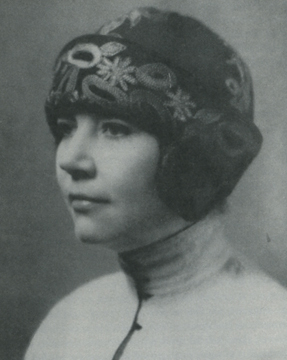 After World War I, Rose became a reporter for the American Red Cross, and was assigned to write about the conditions in war-torn countries. During this time, Rose met two women who would become her closest friends, Dorothy Thompson and Helen "Troub" Boylston, who wrote the "Sue Barton" nurse series for girls. Rose's job took her throughout Europe, but of all the countries she visited, Albania quickly became her favorite. She wrote The Peaks of Shala about Albanian life, and informally adopted Albanian boy Rexh Meta after he saved her life. Many years later, she provided money for Rexh to come to America and get a college education. Rose returned at last to Rocky Ridge Farm in 1924. Her writing turned back to the Ozarks at this time, as well, and she wrote two of her most enjoyable novels, Cindy and Hill Billy. However, Rose was not content to stay in Missouri. She and Helen Boylston returned to Albania; their journal of the trip was published as Travels With Zenobia. Photo courtesy of Herbert Hoover Presidential Library. Used with permission. The unstable situation in Albania forced Rose back to Missouri in 1928. She and Helen moved into Rocky Ridge Farmhouse, and Rose had a modern rock house built for her parents on another part of the farm. Rose felt financially stable at last, and she freely spent money on the new home for her parents, as well as making major updates on the farmhouse. She lost most of her money in the stock market crash of 1929, however, and returned to her pen to earn a living once again. While living at Rocky Ridge, Rose encouraged her mother to try to earn a bit of extra money writing, as well. Laura recorded the many stories she had told Rose as a child into an autobiographical manuscript, which she called "Pioneer Girl". Rose sought a publisher for her mother's work unsuccessfully. However, after reworking a part of the manuscript into a children's book, a publisher was found, and Little House in the Big Woods came into being. While her mother continued working on her "Little House" series, Rose used her mother's stories for her own works of fiction, as well. She wrote Let the Hurricane Roar in 1933 and Free Land in 1938. She also wrote about her childhood years in Mansfield in Old Home Town. In 1938, Rose moved to New York, and Laura and Almanzo returned to their farmhouse. Rose then moved to Danbury, Connecticut, where she became heavily involved in politics, as she wrote about in The Discovery of Freedom. (Read the book here.) In 1943, Rose met Roger Lea MacBride, teenage son of one of her editors. Roger admired Rose, and she taught the young boy much about her political beliefs over the years. Roger called Rose "Grandma" and later became her attorney and heir. In 1957, Laura Ingalls Wilder died. Rose worked with Mansfield resident Irene Lichty to preserve Rocky Ridge as a memorial to her mother. She published her mother's diary as On the Way Home , the last book she would ever help her mother write. In 1965, Rose went to VietNam as a war correspondent. She planned yet another trip to Europe for November 1968, but it was a trip she was never to take. Rose died on October 30, 1968. She was buried in Mansfield, Missouri. Some of Rose's books have recently been republished and are available for purchase at the Frontier Girl Mercantile. Also, HarperCollins Publishers has released a spin-off series to the "Little House" books based on Rose's childhood in Missouri. The titles in this series are: Little House on Rocky Ridge, Little Farm in the Ozarks, In the Land of the Big Red Apple, On the Other Side of the Hill, Little Town in the Ozarks, New Dawn on Rocky Ridge, On the Banks of the Bayou, and Bachelor Girl.